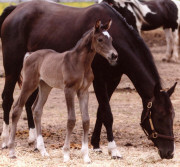 Wyriska has presented us with a tall, graceful black filly – born at the agreeable hour of 8:30 pm. This filly’s birth is the source of much happiness. The new owner of her dam Wyriska, Elaine Shipley Potter, is so relieved with a safe delivery. Elaine is my old dressage coach – who started Wyriska’s undersaddle training last fall, when she was about 60 days in foal to Freestyle. Elaine had fallen in love with the mare – such an affectionate, self-possessed, balanced and trainable student — and could not resist her. So they will be future dance partners and best friends! Even happier – a client of Elaine’s, Dr. Ophelia MacDonald, also fell in love with Wyriska. Hoping that a new black filly would be born in 2008, she purchased the rights in-utero, and now has her own silky smooth dark princess around whom to weave her hopes and dreams.